The Fujian Tulou are unique communal residential buildings constructed by the Hakka people from Fujian Province. The Tulou are several stories high and are enclosed by a thick earth wall. Some are circular in form while others are rectangular or square. They were built around a central, open courtyard with only one entrance and few windows. This building style was chosen because it made the houses well defensible. Each tulou was occupied by one family clan. The largest ones provided space up to 800 people. The tulou were built between the 14th and 20th century. The Fujian Tulou were the last WHS of my 2019 China trip and it undoubtedly was the best sight of them all. They aren’t highly visited by our community members (ranked 620th out of 1092), but nowadays these distinct communal housing structures are easy to reach. From Xiamen, the nearest large city, it takes about 3 hours. On my way down I took a fast train to Longyan and a shared taxi from there. For the return trip I caught one of the 3 direct buses per day from Hongkeng to Xiamen. I can really recommend staying overnight in one of the Tulou. I did so at the Changdi Inn in Fuyu Tulou, which lies in the ‘folk’ village of Hongkeng. The Fuyu Tulou is not round like most, but has a stepped construction (it apparently is “the most famous five-phoenix-style earthen building”). They have a number of rooms here that they rent out to guests; there were 7 other foreign tourists staying overnight during the same weekend as I was. The extended family of the owner lives there also. Together they inhabit a vertical cross section of the Fuyu Tulou, with other families living behind the same front door in other vertical sections. When you are staying in a tulou you get a good impression of what life in this kind of communal house entails. The doors are always open: that means that everyone walks in all day. It could be the neighbours, a greengrocer or (in this special case) drivers who come to pick up guests. At night all is quiet, you will only be woken up by a crowing rooster at 6 am. Hongkeng itself is a nice village where many tulou are still standing and are inhabited. It is stretched along a river - 3 km from one end to the other. A common sight in the streets are the vegetables that are being dried. Geese and turkeys are also kept. I visited the town on a Saturday afternoon and expected it to be very busy, but it was wonderfully quiet. The next day I visited a couple of tulou in other valleys and villages. On the back seat of a motorbike I was first driven 25 km to a very well-known vantage point: that with a view on the Tianluokeng cluster. Here it can be very busy during the day, but when we arrived at 10.30 most day trippers had not arrived. This cluster consists of 1 square, 1 oval and 3 round tulou. These 5 tulou so close together form one cosy village. There was a market going on in one of the streets and the square building was being prepared for a wedding later that day. With the motorbike we visited some more tulou in this valley. One of the most beautiful ones has a stone temple at the center of the courtyard. It is the Yuchang Lou, also one of the oldest and biggest. Next to the tulou the local temples are also of interest. We visited for example the Deyuan ancestor temple in Taxia. In front of this basic temple stands a semi-circular row of 10m high stone flag posts. These decorated flag posts were made to remember distinguished members of the family clan. The busiest tulou on the trail is the 'King of the Tulou'. This is a large, round specimen with as distinguishing feature that it consists of 4 concentric rings. When you step inside, you will encounter another ring, and another and finally a little one with a temple in the middle. The inner rings also all contain small rooms, which are for example used as kitchens. This was the only tulou that I visited which felt too commercialized. In general, tourists pay an entrance fee per village / valley / cluster to see its tulou. This can add up: Hongkeng and Tianluokeng both ask for 90 Yuan (11.60 EUR). In addition, you have to pay 50 Yuan (6.45 EUR) separately for the 'King of the Tulou'. One usually can have a look around freely on the ground floor of any of the tulou in these villages, but you are not allowed to go upstairs to the higher floors where the inhabitants live. I visited Fujian Tulou in 2005, when there was only limited road access for tourists. It is important to note that these villages are defensive in nature for the Hakka people. The Hakka people migrated from north central China to flee wars in Henan Province in four major waves from the 7th to the 9th Century, and are resettled chiefly in four southern provinces, Fujian, Guangdong, Hunan and Sichuan. Hakka in their language means Guest People. As outsiders, they were subject to persecution and attacks, hence the circular shaped building where all activities are enclosed in the middle. Homes are attached, with the defensive wall facing the outside. The ground floor is for livestock, second floor for living and third floor sometimes used for storage. There is a Hakka Museum in one of the buildings, giving a history of the Hakka people, including many prominent people in history, including political leaders of various stripes. Included are the rebel leader Hong Xioquan (God's Chinese Son), who lead the civil war from c. 1840-60 that killed 30-40 million people, Mao, Deng, Singapore founder Lee, etc. Interesting anecdote from the Cold War. The US satellites took pictures of the Tulou back in the 60's and the Pentagon thought they were missile silos. The sky finally took a turn for the better as we approached Hekeng Tulou Cluster. A short hike to a hilltop lookout gave us a far-reaching view of the below valley occupied by tulou in different shapes and sizes. Our mood finally experienced a slight uptick – the view was fantastic, and the village appeared lively enough to hopefully allow us to spend some quality time there without immediately thinking ahead on what’s next. 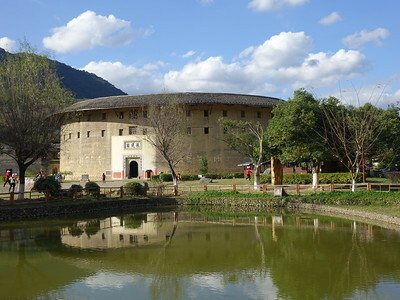 Hekeng doesn’t have a single tulou that can match the fame of Yuchang Lou. Actually the entire village didn't appear much like a tourist destination, with children chasing each other along the narrow corridors and children freely searching for food in the communal area. Invitation to sit down for tea, which we initially were unsure of and turned down, is the local's customary display of hospitality towards visitor. Feeling more at ease, we followed a young mother back to her home. Originally from Hangzhou, Xiao Zhang had brought with her a two year-old daughter to temporary stay in Hekeng to care for her husband's ailing uncle. Recently went to Tu Lou sites in Yongding County and elsewhere in a more rural setting. These buildings are certainly interesting, though to a certain extent it's a case of 'seen one, seen them all'. Only to a certain extent, however, and as long you choose buildings in different areas (rural v town edge, for example, or different styles (Hakka v Fujian), then they remain of interest. For me, however, the big downside was the sale of cheap tourist souvenirs and other stuff everywhere. Every unit on the ground floors of most of the tulou we visited was flogging this stuff, and the internal courtyard was marred by large, brightly coloured umbrellas, there to keep the sun off the stallholders. In addition, although tea is offered 'free' to drink, you are pushed to buy. That's fine, but there appears to be a lot of cheating going on via bait and switch. The tea you drink is nice, but the tea you buy is not. I found this particularly distasteful in a World Heritage Site. I would suggest that consideration is given to ways of taking the sale of souvenirs out of the tulou in order to retain an element of their original feel and splendour. At present, they are marred. Went with a friend last week of August 2008 for a short weekend trip. Shanghai to Xiamen flights can be cheap, so check regularly. Regular buses from Xiamen to Yongding county; takes three to four hours. Haggle with the local drivers for a private coach to see several tulou locations. The best tulou clusters are in Chuxi - quite far (almost close to the border of Guangdong) but it offers the best view from the nearby hill. The family in Yanxianglou (Mr. Su) are extremely friendly. I went to vist this beautiful village of Yongding in 2005 with some friends. We went there from Xiamen by a van and on the way to Yongding we stop at several villages and the food was indeed home cooked type of the Hakka people. The village people are mainly Hakkas and speak their hakka dialet which sound a little bit Cantonese and Mandarin. I was surprise to see that all those Tulou were quite well maintained and liveable. I think goverments with large population should learn from the Hakkas on this type of housing programme. Would condsider another visit soon. Customary ownership: "According to the regulations in Land Administration Law of the People's Republic of China, the lands within the area of nominated property are owned by the peasant collectives. The Tulou buildings are privately owned by the inhabitants, and the public structures inside Tulou are owned by them collectively." (Nom File).